Let's start this one off by saying rG is Shark's #1 fan! rG wanted to undertake a little labor of love with our good friend Jenna Reta, over at Freestyle and at the same time exercise our CG build and development skills. Tons of credit goes to our very own David Takahashi for building this wonderful watch completely from scratch. Often time's clients don't have any CG/CAD assets to get the project started. This is a great example of building the product from the ground up. The team hand crafted custom materials to apply to the watch for a realistic rubber and plastic look and feel. Combining textures and life like motion physics attributes we're able to display and move the watch with realistic accuracy. 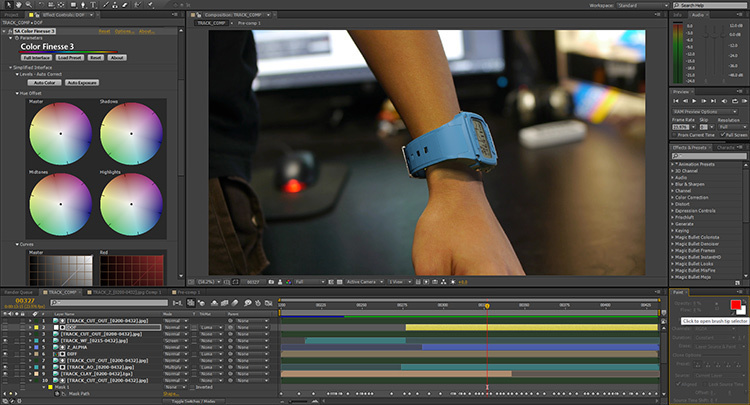 We contemplated building the watches UI from scratch but decided to shoot it digitally instead. We wanted to build a couple custom environments that show off the watch in a clean cool way. We also wanted a couple environments that would contrast each other but ultimately showcase the watch and its features as hero. We definitely wanted to involve some type of liquid element in one of the environments too. The midnight black scene was felt like the best fit. Though we had little time to develop the live action build, we were able to demo a quick cg wrap around the Dave's wrist. Isaiah our master footage tracker, tracked the shot perfectly so Davy could jump in there with the 3D model. In the end all the elements came together for a clean looking composite. If you're wondering, David does not shave his arms. Thanks again for taking the time to check out our little Shark project! It's a great example of some of the capabilities here at Related Grey.